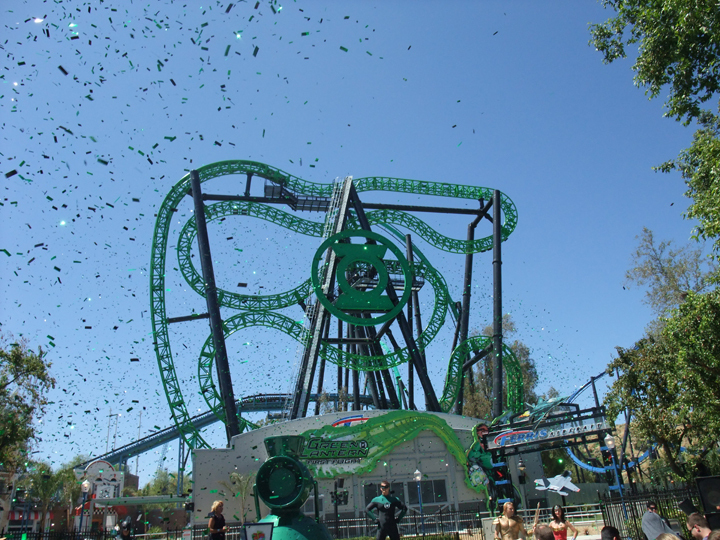 Six Flags Magic Mountain opened their latest roller coaster, Green Lantern: First Flight, on July 1st. 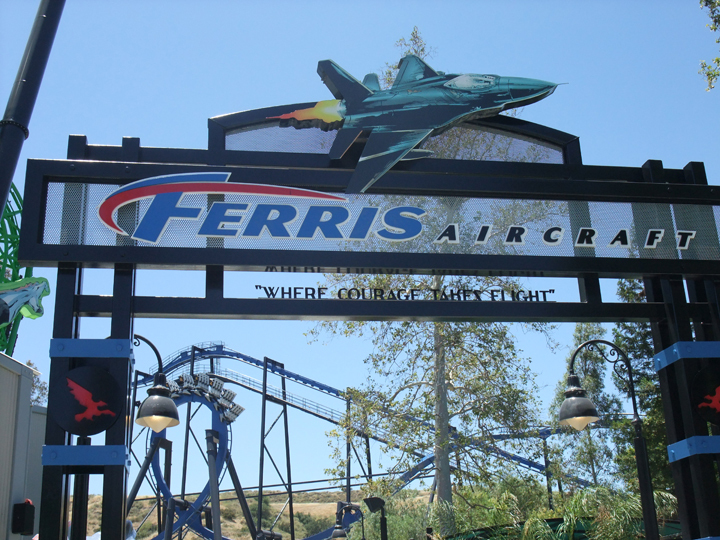 According to the introduction from Magic Mountain’s President, this was their 18th–enough to give them the most roller coasters of any park in the world (they’ve been in a see-saw battle with Cedar Point in Ohio for years). Fans, contest winners, and us journalists were ushered to the part of the park that used to be known as Gotham City. 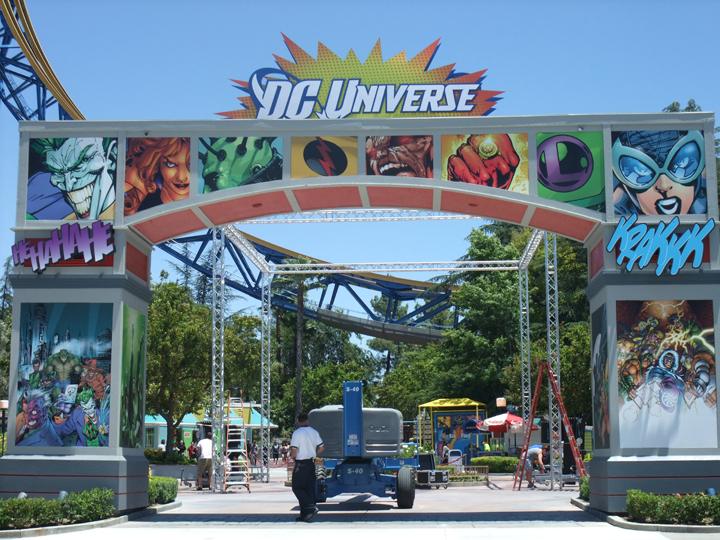 I say “used to” because the surprise announcement of the day was the conversion of that entire section of park to DC Universe. 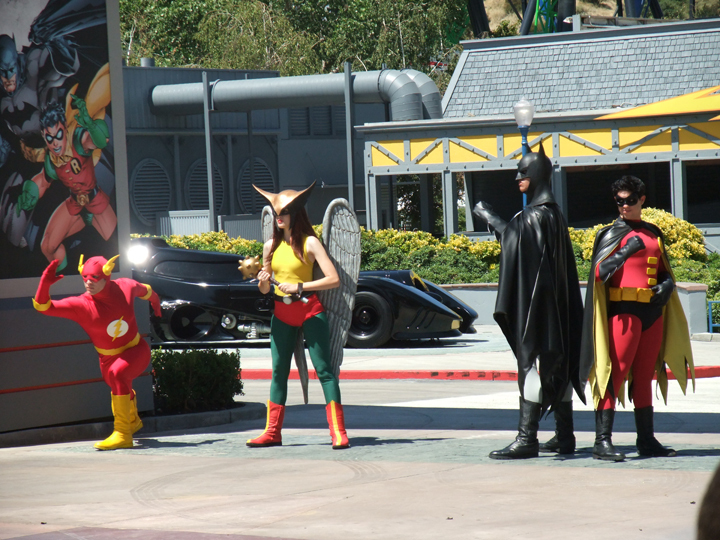 The Batmobile is still present, but now rides have been re-themed to Wonder Woman and Flash, and the food stands are things like Teen Titans Pizza and Kent Farms roasted corn. They’re nice touches. 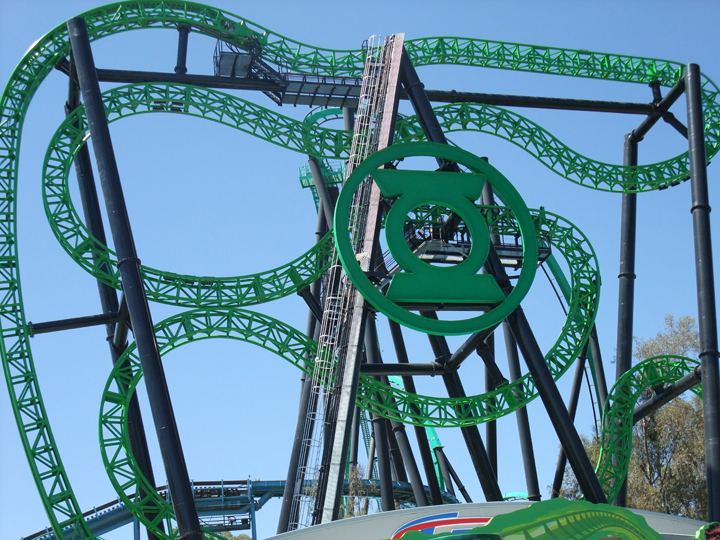 It’s unfortunate that the Superman and Riddler rides are outside this section, but hindsight is 20/20. At least they’re both visible from here. 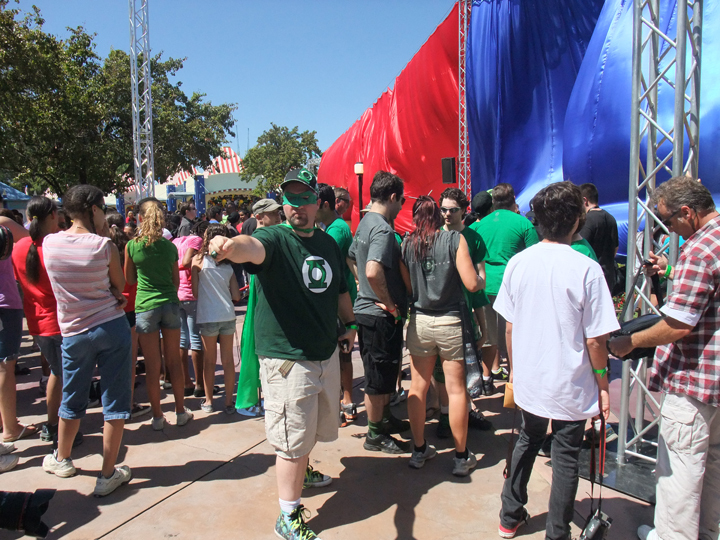 The Green Lantern ride is timed to coincide with the new movie, but they don’t refer to it directly. 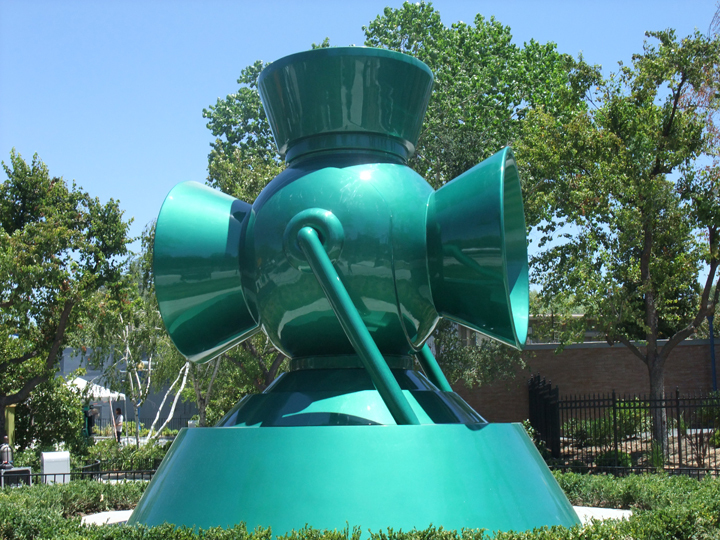 The line area has a giant lantern power battery out front, and the building is themed to Ferris Aircraft, where Hal Jordan works/flies. 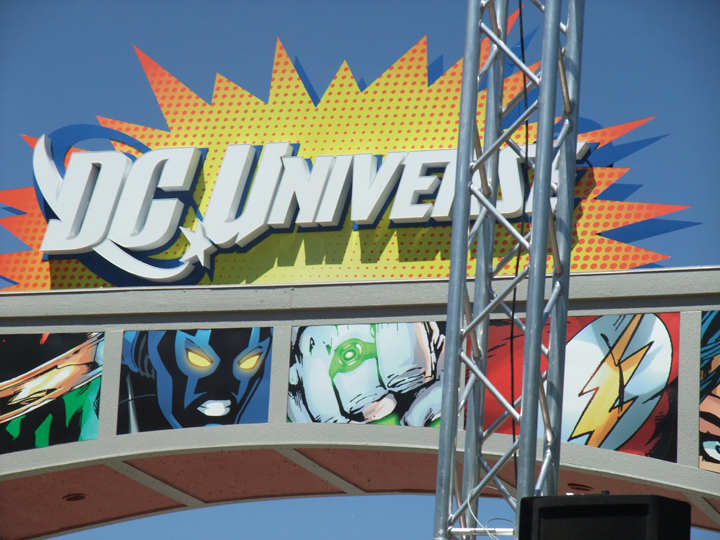 Inside is a mural/sculpture of Abin Sur’s ship, and the next room has a lantern, with the Green Lantern oath written in “alien” along the walls. Possibly because it was the first day of operations, but the line was SLOW. Amazingly slow for a roller coaster. Finally getting up to the platform, I saw why. Each car only holds 8 people. 4 people, in back-to-back pairs, on each side of the track. A normal roller coaster train holds about 24 people, so it makes sense that this line moves almost 3 times slower. The seats have a new kind of restraint I hadn’t seen before. Restrictive, but not tight. The cars are free to rotate on their axis, almost like a vertical Tilt-a-Whirl. Being lifted nearly vertically to the top of the track was fun, and our car had rotated to face down, so it was a good view. The track itself is a compact back-and-forth line, with a few lifts and drops to aid rotation. Our first two trips though, had virtually no rotation. Our car stayed flat (it swayed a little) while we passed through the track. Towards the end, the track gets bumpier, and we ended up doing two full revolutions. Those spins, combined with the track moving under us, combined for some impressive G-forces and disorientation. And then, all too soon, it was over. I had no intention of waiting in line again, but when I looked, it was a fraction of what it was the first time. So I did go again. The second wait was only about 10 minutes, compared to at least an hour the first time. I faced the opposite direction this time, but the experience was almost the same. No spins for first half, 2 intense spins on second half, and over very quickly. 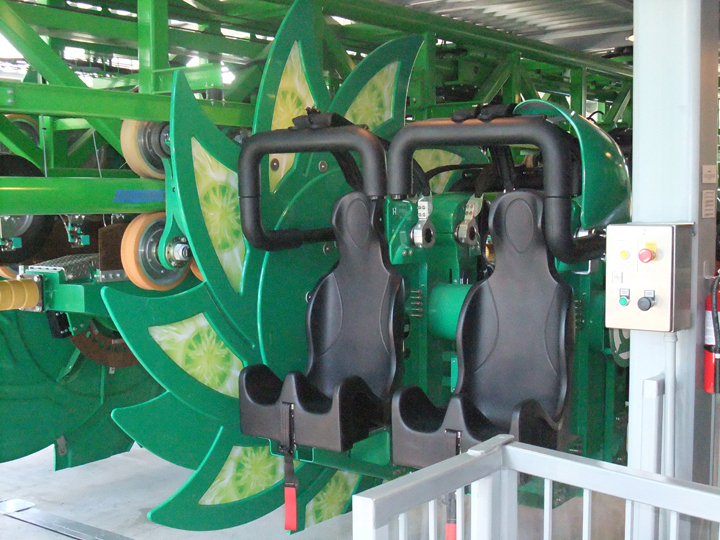 X2, another of Magic Mountain’s rides with spinning cars, has a motor that turns them at specific times. 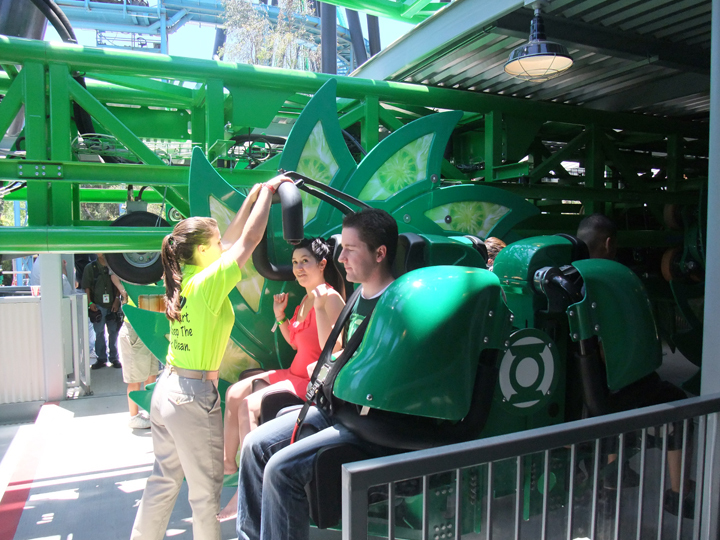 Relying on inertia to spin Green Lantern’s cars is unique, but just doesn’t work as well in practice. Combined with the slow loading times, and very brief ride time, I don’t think this is a must-ride attraction unless the line is very short. 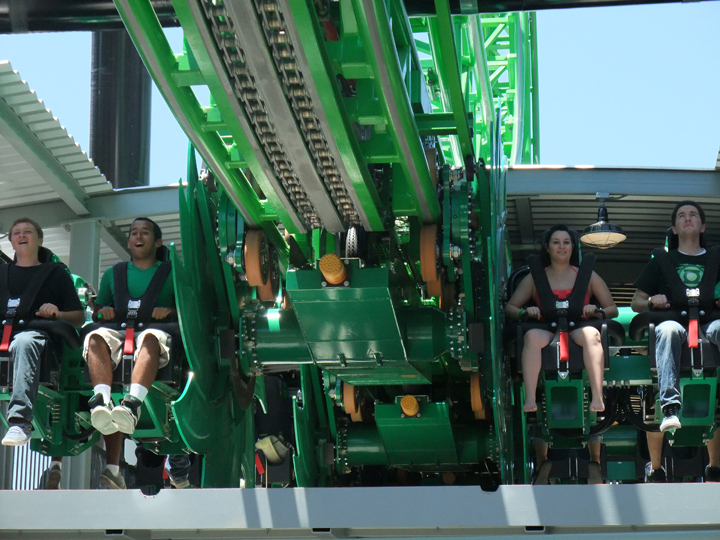 Don’t get me wrong; the ride is still FUN–just not as fun as I was hoping. With no line, I would give the ride itself a 7. 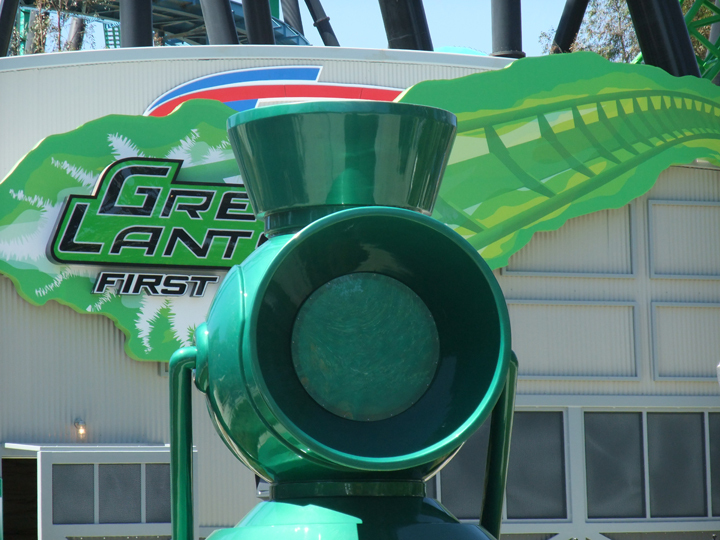 But since there will always be a line as part of a theme park experience, I rate Green Lantern: First Flight a 6/10. 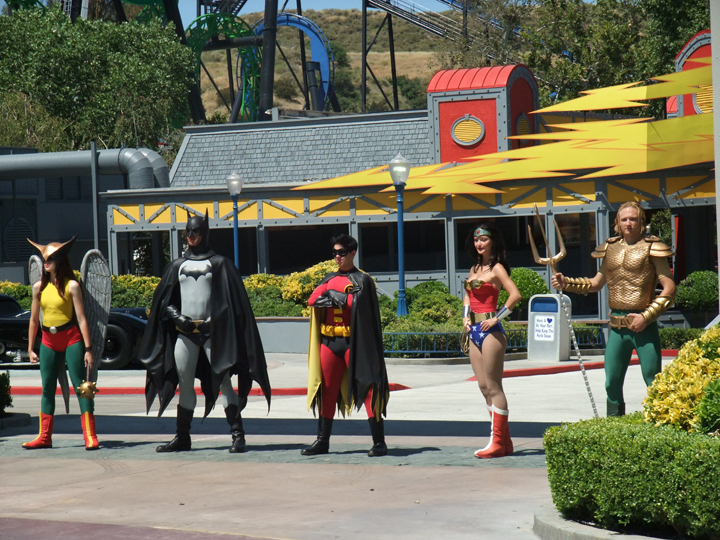 Side note: I also rode Superman: Escape from Krypton while I was there. 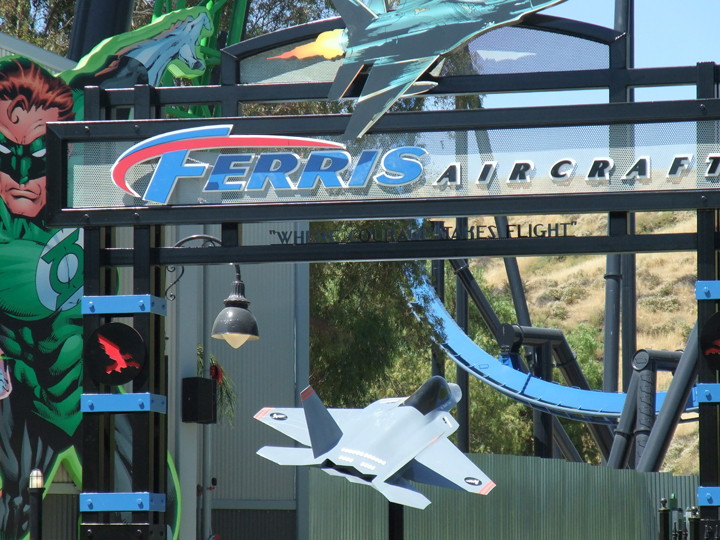 The ride has been around for over a decade, but this year they revamped it by adding new cars that face backwards, and reducing the weight so the cars will go higher. 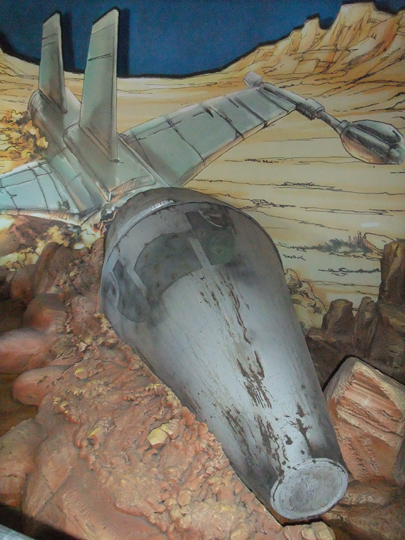 The improvements are great, and this ride was much better. I’d give this one an 8/10.